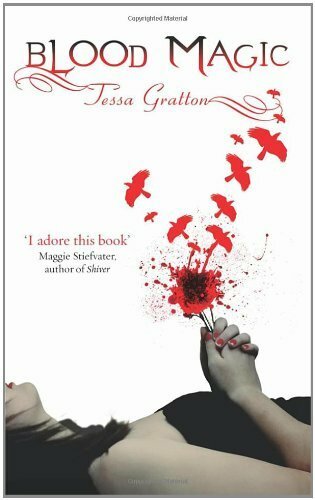 Tessa Gratton is an American author who has wanted to be a paleontologist or a wizard since she was seven. After traveling the world with her military family, she acquired a BA (and the important parts of an MA) in Gender Studies, then settled down in Kansas. She is part of the Merry Sisters of Fate, along with Maggie Stiefvater and Brenna Yavanoff. Blood Magic is the her first published young adult novel. A stand-alone companion novel to Blood Magic, The Blood Keeper, will be released in August 2012. Silla is damaged and lost since the death of her parents. Nick is the new boy in town with a chilling past of his own. A mysterious spell book steeped in blood magic will bind Silla and Nick together. The story started off very abruptly – in a cemetery with Silla trying blood magic for the first time. The background is then revealed slowly throughout the book, explaining how she ended up there. This is a great way to tell a story and it kept me engaged. Blood Magic is a convoluted story about a teenage girl dealing with her mother’s death, a boy coming to terms with his father’s remarriage, and an ancient secret which binds their families together. The supernatural elements are carefully intertwined with the emotional story. The major characters, Silla and Nick were believable and realistic, considering what they had each been through. But I admit I was surprised at how they became obsessed with one another from the first sighting – I always find this creepy when it happens in books. The minor characters, on the other hand, left something to be desired. Silla’s friends were two dimensional and didn’t serve much purpose except to be witnesses to weird things. I feel there is a lot more potential for Nick’s father and step-mother which isn’t explored, and Nick’s hatred for his step mother is never explained either. The best aspect of the book is undoubtedly the writing quality. There is something haunting and spooky about the way the book is written. The book has a poetic, lyrical feel to it, and I loved how Nick expressed feelings in haiku form (although this reminded me of Sam in Maggie Stiefvater’s Wolves of Mercy Falls series, who thought in song lyrics). Speaking of Stiefvater, I absolutely adored the mention of NARKOTIKA in Blood Magic, it’s very cute. This is a wonderful book, with “all the blood and none of the vampires”. It will appeal to YA readers, who will able to relate to Silla’s experiences well. I will be eagerly anticipating the stand a lone companion being released in 2012.